Learn the science of art conservation. Go behind-the-scenes at the Detroit Institute of Arts with Detroit Public TV Virtual Field Trip and go where no one has ever gone before! What lies behind the surface of a 400-year-old sculpture? Is what you see on a painting real, or did the artist mean to draw something totally different? And, what about Infrared Reflectography—what does that exactly do? 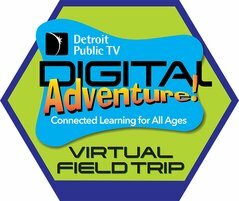 Detroit Public Television teamed up with the Detroit Institute of Arts for a Virtual Field Trip to take students and teachers behind the scenes into the restricted area at the DIA to help them explore new ideas and dig deep under the surface of art and science. Your students will be able to earn digital badges along the way to document the learning that is taking place. Go where no student or teacher has gone before and explore science at the DIA!